My mom's birthday was yesterday, and I made this pretty card for her. To get my woodgrain background, I stamped Papertrey Ink's Background Basics: Farm & Barn on Soft Stone cardstock with Soft Stone ink. I distresed the edges with my Tim Holtz Paper Distresser to add to the rustic look. 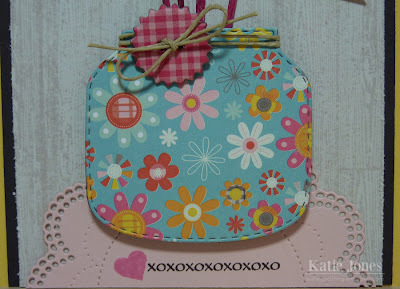 My cute little jar was made with My Creative Time's Stitched Chunky Jar Dies. I used some pretty patterned paper from My Mind's Eye My Girl collection and tied a button from the same collection with some thin kraft hemp. 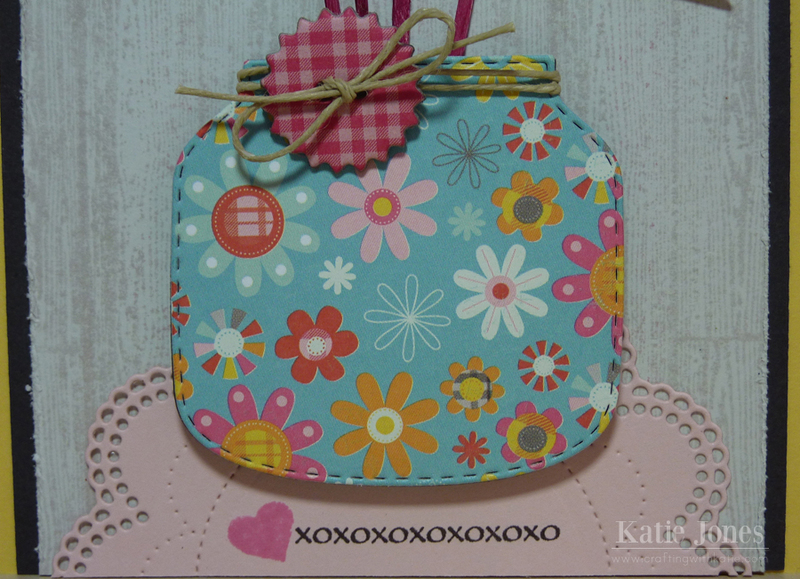 The pink doily was made with MCT's Stitched Doily Die, and I stamped a heart and sentiment from MCT's Lots of Love stamp set. For my flags, I started with coloring some toothpicks with Copic Markers in a color that coordinated with my project. 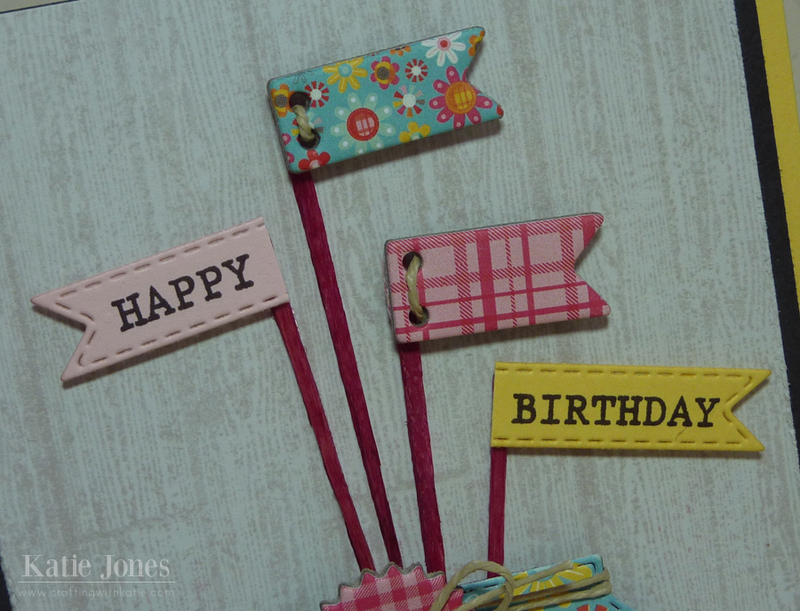 The paper tags with the sentiment were made with MCT Chocolate Greetings. The two patterned flags are from the MME My Girl Decorative Buttons. You can find the My Girl collection and the thin hemp at Liz's Paper Loft Boutique. katie, this is soo cute! the chipboard banners as flags are perfect! I'm sure you mom loved her card! Love it! And I bet she did too! Love your card! Everything about it is so cute & happy! TFS! I am thinking I need this jar die! This is too cute. Your Mom will love your card. I like the toothpicks colored with the flags. The button and hemp are perfect and show nicely with the wood background. 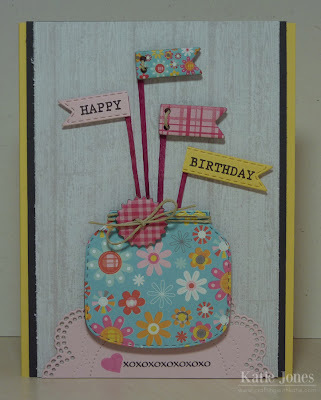 Your card is really beautiful and creative! I was so excited to see your post, I've missed your projects! Katie ~ Oh this is just BEAUTIFUL! I just LOVE the idea of making those dies into flags then you go and color the tooth picks to coordinate them! The background is GORGEOUS and the doily is PERFECTLY placed! Okay this reminds me of a glass jar sitting on a big country porch! You know I know all about country! LOL! Happy Birthday to your Mom ~ I bet she LOVED it! Its a unique card. I like its designing. You can send this to your friend on his/her birthday too.